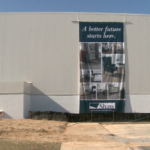 Andalusia’s soft and hard floor manufacturing distribution company Shaw Industries Plant 65 location is celebrating a large investment. This comes after its Dalton, Georgia headquarters chose to invest $250 million into the facility. “It’s a huge development for the great state, for Andalusia, and especially for the workers that are here. It’s the largest employer in the county,” Governor Kay Ivey says. Five years ago, Shaw Industries began the process of improving and creating technology that would help improve its production. It chose the Andalusia facility to place the new technology. The project includes construction of new and expanded building assets, and installation of substantial amounts of new manufacturing equipment. Some employees say they welcome the change because it insures Plant 65 remain open for at least 30 more years. The location of the facility in the Andalusia community helped make the decision for the investment. “We’re very thankful that shaw decided to take the endeavor to make us a plant to be successful for the future,” Shaw Human Resources Trainee Department employee Danny Taylor says. “Just primarily the people. The people here at Andalusia in this facility, it’s an excellent team that is very capable of integrating this technology,” Morgan says. Some of the new equipment is already being used. The project is expected to be completed in 2020.